I’ve been away from here for too long, I’ve been distracted by little things. A new camera with a broken dial that needed to be sent back once and a bit more of a learning curve than the point-and-shoots I’m used to. An excursion to Michigan for a holiday weekend with extended family including a new little one to meet. But now I have a luxurious week off. And it’s time to catch up. I can’t seem to get enough chickpeas, in any form. It’s surprising then, that I had never attempted falafel. I had heard reports from many friends of homemade falafel disintegrating or turning to mush, and I can buy some excellent falafel on the cheap at a little place a few blocks away. It hardly seemed worth the effort. But somehow, a few weeks ago, I found myself with a bag of dry chickpeas in hand staring at a new recipe. I’m glad I did. These were easily worth the effort involved. These weren’t at all mushy, and while they were a little bit on the delicate side, they never threatened to disintegrate. The secret to the right texture, I’m convinced, is starting with dried chickpeas rather than canned. Apart from soaking the chickpeas overnight, which requires some planning, these come together quickly, and they’re a cinch to make. A few a minutes of chopping, a few seconds a zizzing everything together in a food processor, and then a little bit of time rolling the mix into balls and pan-frying them. Maybe a half-hour of work, maybe less if you’re speedy. They look and taste a little green–in a bright, fresh, good way. These have quickly become a favorite. Dried chickpeas are really the way to go here. They’re so cheap and easy to find that it’s really worth going to the trouble of doing the overnight soak here (and really, it’s only about two seconds of active work the night before). The ingredients are all readily available. You can use all cilantro or all parsley or a combination of the two, and any of the spices and seasonings can be adjusted to your taste. These are excellent with tahini sauce and pita, along with a bit of cucumber, tomato, lettuce, and onion either together as a sandwich or as a simple salad along side. Soak the chickpeas in cold water overnight (or for at least eight hours). Drain the chickpeas. 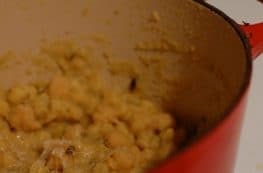 Add the chickpeas, onion, garlic, cilantro or parsley, cumin, coriander, red pepper flakes, and salt to the bowl of a food processor, and pulse until blended into a coarse, crumbly mixture with small but distinct bits of chickpea remaining–you don’t want a paste here. Add the baking powder and flour and pulse a few times. Pinch a little bit of the mixture together and see if it holds. If it won’t hold together, add another tablespoon of flour and test again. Roll the mixture into one inch balls and set aside. In a large cast iron or nonstick skillet, heat a thin film of oil over medium heat. 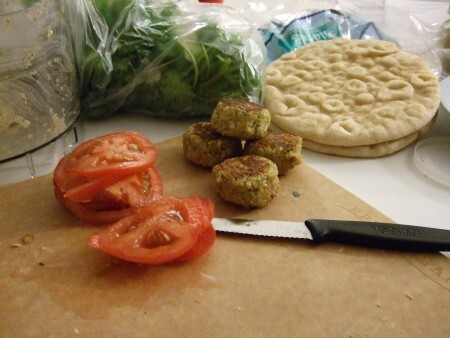 Add falafel balls, leaving enough space to maneuver around each with spatula or turner. (My pan holds about a third of the falafel at a time.) Cook, undisturbed for a few minutes, or until browned on one side. Carefully slide a thin spatula underneath each ball and flip to cook the other side. Serve with tahini and pita and any other accompaniments you prefer.